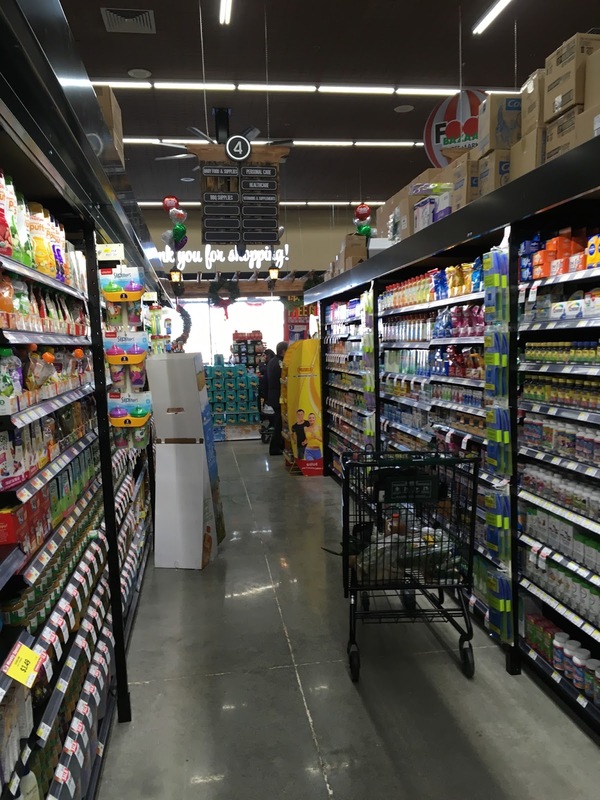 The latest from Food Bazaar's aggressive expansion opened on Thursday, December 1. 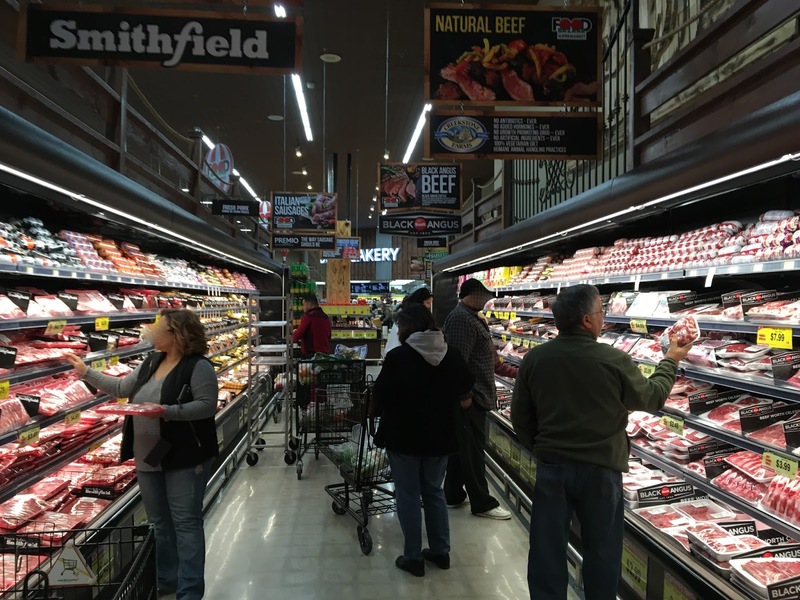 It's a former 45,000-square-foot A&P Fresh Market that was extensively renovated. The A&P closed last November. Fairview's other supermarket is a Key Food Marketplace operating in a former Food Basics not too far away. 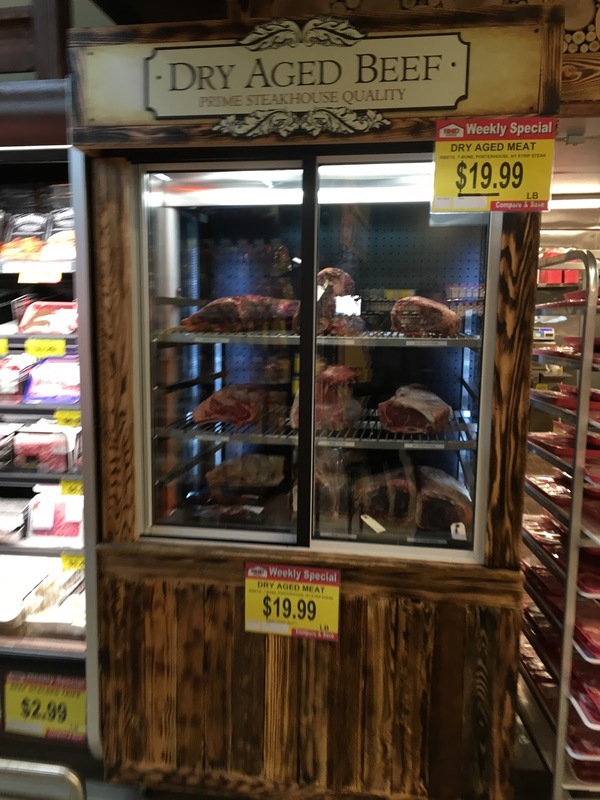 The A&P Fresh Market had the first version of the "Fresh" renovation. Back in May, when I visited the Key Food, there was not much going on at this location that I could see, but the windows were all covered. The banner reading "A&P FRESH MARKET" has been removed. That section of the facade is now blank. 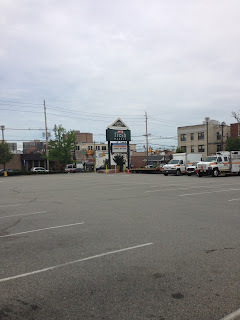 The sign facing Anderson Ave has been replaced with a white Food Bazaar Supermarket sign. The Fairview Food Bazaar follows all of the latest design trends and is a beautiful store. Its layout is practically identical to North Bergen's, save for the liquor department in the last aisle. There were banners around the parking lot advertising the grand opening. The parking lot is actually pretty small and was extremely crowded today. Sorry about the sun! The entrance is under the Food Bazaar logo on the far right side of the store. You enter into the produce department first, with seafood and meat behind. Dairy runs along the far side of the store and deli/bakery are in the far back corner from the entrance. 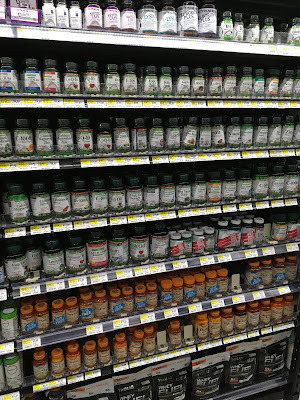 The selection is extremely diverse, as are the shoppers. 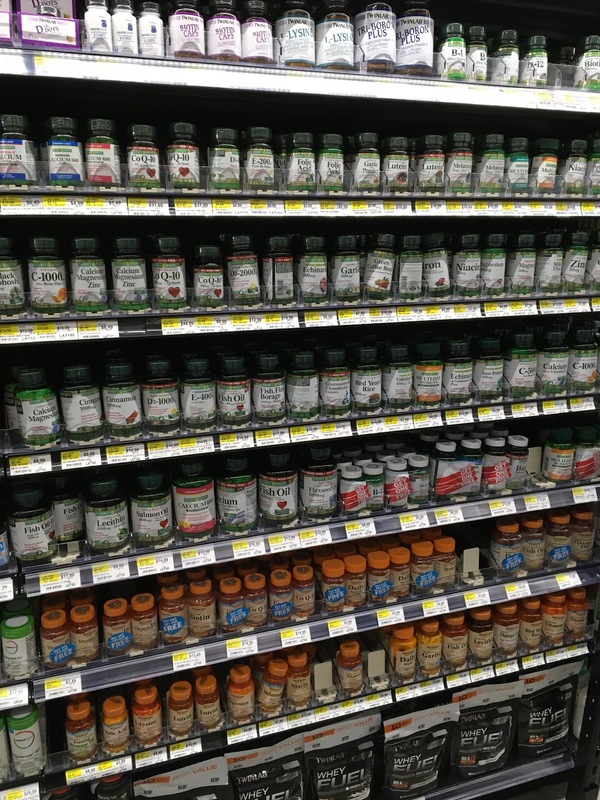 The area is primarily Hispanic, Korean, and Italian, and all three are heavily represented in the store's selections. Looking towards the back wall of the store. Produce is behind me, seafood is to my right, and meat is straight ahead along the back wall. 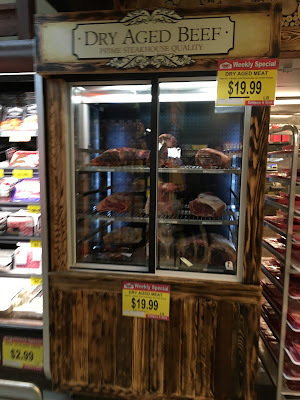 Some Food Bazaar locations, like this one, offer dry aged beef. I'm not a big meat eater, so I don't know exactly what its advantage over regular beef is, or how it's different. But it looks interesting. The doorway straight ahead here leads back to meat, seafood, and produce. Grocery aisles are to my right. For a reasonably small, urban-style store, there was a very large HABA section, one whole aisle. Often this type of store will limit its HABA selection to a few shelves behind the customer service counter. Continuing around the store, there are four international aisles, and a large deli, bakery, and prepared foods section which is extremely impressive, if a little on the pricey side. Also near the deli counter is a large fresh bread area, which I could not get a picture of because there were too many people in front of it. Around the corner there is a sushi counter and a hot food counter. 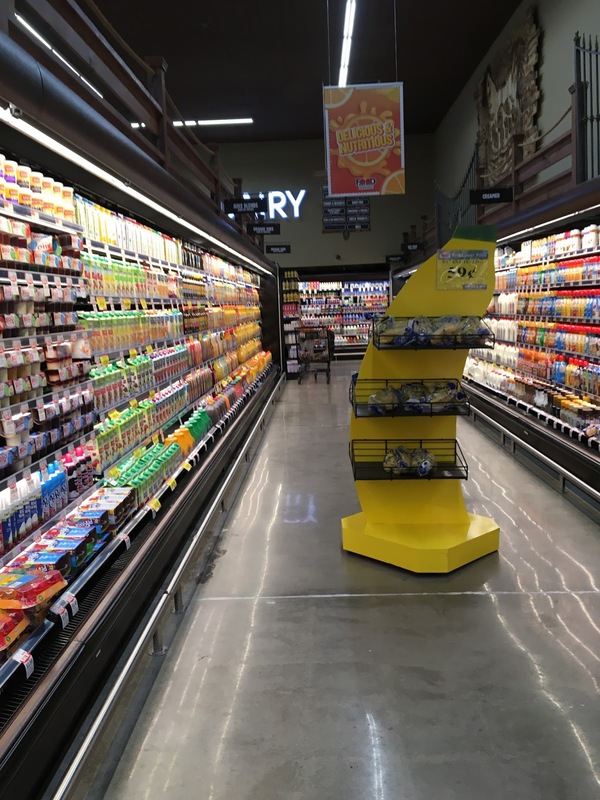 The last aisle of the store is dairy. The dairy section continues along the front wall for a short time. Around the store there are various graphics suggesting the products sold underneath. (There are also straightforward category markers!) These signs are actually real wood, and very impressively made. The front-end was extremely crowded so I couldn't get too many pictures. It was very similar to North Bergen. The entrance is straight ahead to the right here, and the row of yellowish lights you see to the right are the checkout lights . . . every single checkout was open, and some lines still reached all the way into the grocery aisles. 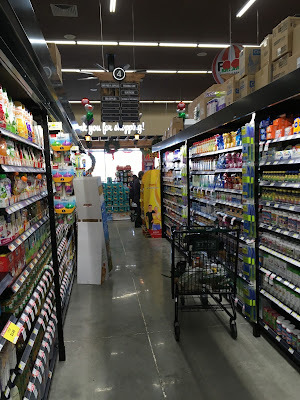 All in all, the Fairview Food Bazaar is a really nice store, if a little cluttered. It's slightly more expensive than its competition but also sells much more upscale products. The design is really attractive and the employees are very friendly, though! P.S. Spencer An, the president of Bogopa Service Corp. (Food Bazaar's owner) was at this store while I was here. I met him at the grand opening of the Elizabeth Food Bazaar, and he is really friendly.